Dr Martens MADE IN ENGLAND Black Leather Eye Boots Men Shoe Size 8 Women 9 1460. Shipped with USPS Priority Mail. Doc Dr Martens Green Leather Boots MADE IN ENGLAND Vintage Mens 9. Condition is Pre-owned. Shipped with USPS Priority Mail. New with flaws as seen in the photo. Right boot has some kind of oil residue on the leather. That will not come out. The boots have never been worn just kinda mashed up from storage. Condition is Pre-owned. Slight pilling around the top of ankle black strip, see picture.Good Condition. Dr. Martens IRONBRIDGE SAFETY STEEL TOE & MIDSOLE INDUSTRIAL BOOTS BRAND NEW BOX. Condition is New with box. dr martens mens boots size 9. Shipped with USPS Priority Mail. Dr. Martens NASHVILLE Brown Leather Ankle Boots. As rugged as they are comfortable to wear, these Nashville Boots boast classic, clean leather styling Dr. Martens are known for. Dr. Martens Men's 1919 10-Eye Steel Toe BLACK FINE HAIRCELL ALL Sizes!!! Condition is Pre-owned. Great condition. Very minor scuffs on toe. Shown in pics. VTG Dr. Martens 1460 8 Eyelet Aztec Boots Made In England UK 8 / US 9 Condition is Pre-owned. Shipped with USPS Priority Mail. Lace front boots with rubber soles. 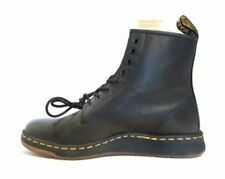 Dr Martens Doc Steel Toe boots pull on ankle black Size 9 USA Condition is Pre-owned. Normal wear. Shipped with USPS Priority Mail. Dr. Martens Victor Chelsea Boots - Black Leather - Men's Size 13 Fast Free. Condition is Pre-owned. Shipped with USPS Priority Mail. Vtg beautiful Doc Martens 1400 brown boots sz 6 mens / 7 womens. Made in England . Condition is Pre-owned. * no laces included Shipped with USPS Priority Mail. These boots are preowned and in great condition. Great and comfortable boot. (BLACK LEATHER. Upper: Leather. Sole: Man Made. Sole Width (at widest point): 5". We will start this process you just need to agree. -If there is a problem just let us know and we will fix it-. for a better gauge of actual size.). Condition: Shoes are in great condition as you can see by the pictures. England made Dr Marten Steel toes. Armpit to armpit (chest):". clothing & outdoor gear to the masses CHEAP & FAST! Wrist cuff to seam at shoulder (sleeve):". Seam at collar to bottom hem on back center (length):". Vintage Men's Doc Martin Brown Leather Boots Size 9.5? Vintage Men's Doc Martin Brown Leather Boots Size 9.5?. Condition is Pre-owned/Vintage worn. Shipped with USPS Priority Mail; FREE for you! 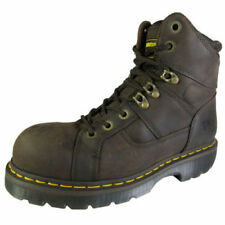 NEW Doc Dr Martens Industrial Steel toe boots ASTM approved boots Size 12 steel toe brown leather. New, never worn. Tags are included but not attached. Condition is Pre-owned. T hese boots have recently been cleaned and leather rejuvenated, they are ready for your next punk show or festival! The soles and leather have plenty of life and years to give! Brand NEW never worn does not come with original box. Dr. Martens Mellows Brown Tan Mens Sz 11 Leather Boots Shoes. Shipped with USPS Priority Mail. Like new ! Dr Martens Lyme Black Leather Chelsea Ankle Boots Men's EU 42 US M 9 UK 8. Shipped with USPS Priority Mail. Mens Dr. Martens Sawyer Boot (Used With Box). Condition is Pre-owned. Shipped with USPS Priority Mail. Great condition overall, very little wear. Distressed Leather Upper. Textile Lining. Rubber Outsole. Due to the nature of the leather/suede, small variances of color in the skin may occur, this is in no was considered a defect. Appears to be new. Bottoms show little to no wear. Shoe box is not included. Doctor Martens Pascal Renaissance Leather Boots Unisex 8 Eyelets. Excellent used condition. Has Doc Marts well known bouncing soles. Check out the pictures for a good look. Dr. Martens Men`s Jadon Aggy Style BLACK Smooth US 9 EU 42 UK 8 LAST!!! Tower above your peers in the vertigo-inducing style of the Jadon 8-Eye Boot by Dr. Martens®. US 9 EU 42 UK 8. Air-cushioned rubber outsole is slip-resistant with a high degree of oil, fat, petrol, alkali, and abrasion resistance and has first-class energy absorbing qualities in the heel strike area. 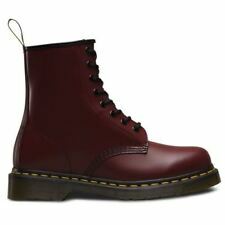 This is a Pristine pair of Dr. Martens 8-eye Boots Size Men’s US 8 UK 7 EU 41 Women’s US 9. Shipped with USPS Priority Mail. I have for sale a nice barely worn pair of Dr. Martens black leather or faux leather work boots. I also have another pair in gray canvas boots in size 11. DR. MARTENS 2976 CHELSEA PULL-ON SMOOTH LEATHER BOOTS [ALL COLORS & SIZES] NEW! Dr. Martens Awley 6" Men's Dark Brown Leather Combat Boots BRAND NEW! Dr. Martens Awley 6" Men's Black Leather Combat Boots BRAND NEW!